If you are looking for brilliant colour in an ornamental gras then a stunning cultivar Cordyline banksii ‘Electric Pink’ with its brilliant foliage makes an excellent choice for either garden or container. As a feature in a container or planted in groups in the garden this is a cordyline that will bring a touch of the tropics to any garden. As the weather gets cooler Cordyline banksii ‘Electric Pink’ gets even better as the foliage deepens in color and adds interest trough the dull winter months. 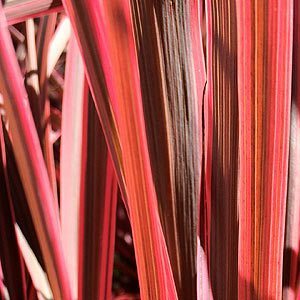 Other than an application of some slow release fertilizer in spring and a tidy up of any dead or damaged foliage Cordyline banksii ‘Electric Pink’ requires little care. It is reasonably drought tolerant and with foliage year found except in the coldest climate it tolerates extreme temperatures without any fuss. Widely available for sale from nurseries in most states.